Members of team Open Water on Lee (five of seven pictured) will brave Lake Michigan at midnight Saturday to raise money for cancer research. The swimmers are North Shore residents and members of the local swim community. 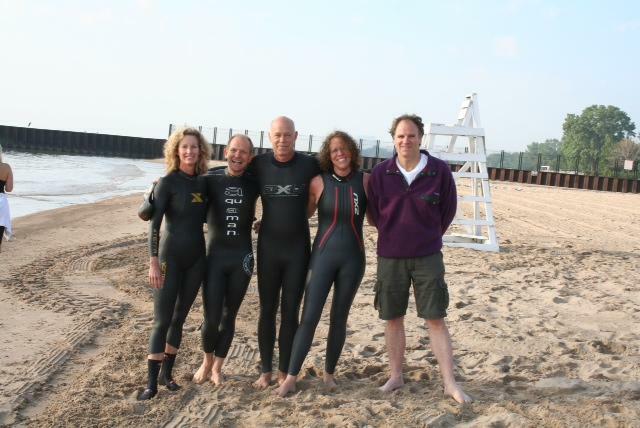 An Evanston-based team of seven swimmers will swim across Lake Michigan this weekend to raise money for cancer research. The group, named “Open Water On Lee,” will participate Saturday in Swim Across America’s first relay race across the lake. Open Water on Lee is one of three teams swimming to benefit cancer research at Chicago’s Rush Medical Center. The team will swim from Ohio Street Beach in Chicago to New Buffalo, Mich. — about 41 miles on a map, said team member and founder Michelle Milne. The swimmers have practiced in the dark and plan to wear glow sticks to see each other during the relay. Team captain Chip Gilbertson (Kellogg ’87) said the swimmers hope to arrive at the finish line Saturday evening after as long as 17 hours in the lake. Milne said he has been participating in Swim Across America’s Chicago events for years and started the team with Gilbertson’s help by recruiting swimmers in the Evanston area. The team has raised more than $40,000 in donations and hopes to exceed its $50,000 goal. “It is imperative that we give back,” Milne said. Gilbertson said the swimmers are driven by both their personal ties to cancer and love of the sport. Gilbertson also called the event “important community builder” and said support from the Evanston swimming community has been inspiring. Teammate John Schoser said raising money for the cause has allowed him to hear the stories of others affected by cancer. On Saturday, the swimmers will brave a “fairly volatile” Lake Michigan in the name of those affected by cancer, Gilbertson said. “It pales in comparison to fighting the good fight,” Schoser said. Assistant summer editor Jeanne Kuang can be reached at jeannekuang2016@u.northwestern.edu. Follow her on Twitter at http://www.twitter.com/JeanneKuang.